This Valentine mailbox for kids is what we are doing in my daughter’s kindergarten class this year. I love the cereal box Valentine holder we did last year, but this year I wanted to do something different. I tried to come up with an idea that the kids would enjoy making and was accessible to younger children. For some reason, I had fingerprints on the brain, and this was the result of my pondering. I am the room mom for my daughter’s class, so we will be making a bunch of these. I sent home a letter asking parents to send in large shoeboxes, so hopefully those will begin rolling in soon. 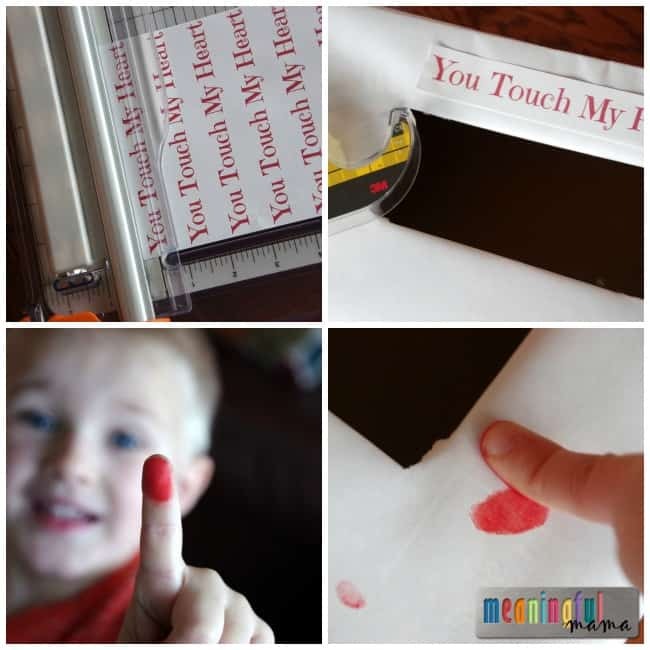 Children’s names can be done with markers, computer print out or letter stickers. Using a utility knife, cut out a rectangular opening in the lid of the box. Wrap the box in white paper, just like you would wrap a Christmas or birthday present. Poke a hole in the paper at the center of your rectangular opening. Cut out to the corners of the rectangle. 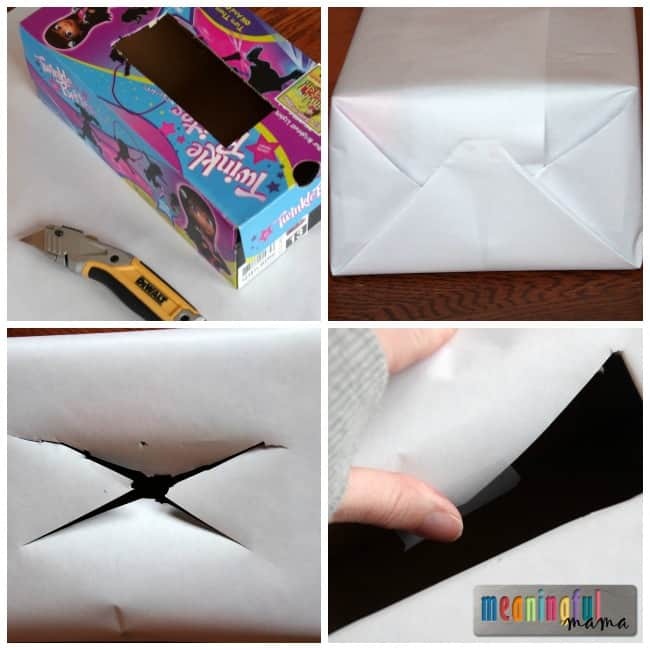 Add tape to the four paper points, and fold the paper to the inside of your box, adhering it to the bottom of the inside of the lid. You now have a nice looking opening at the top of your box. 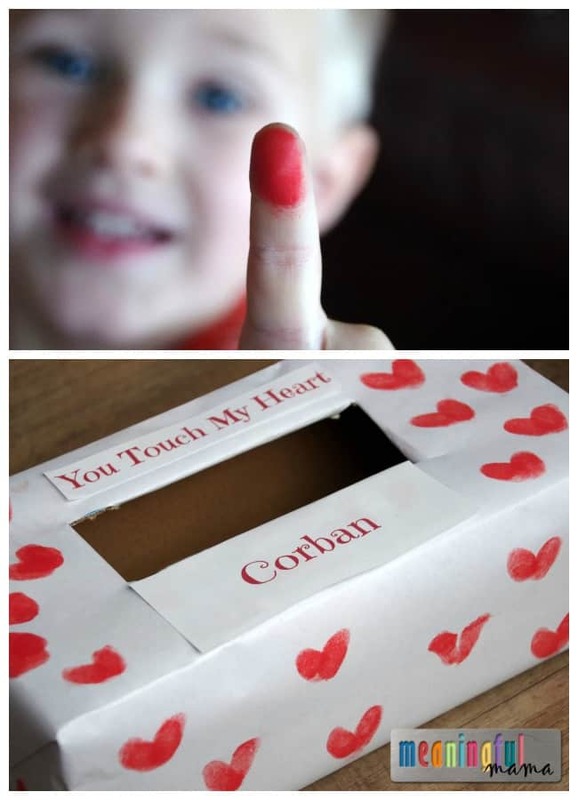 Print out the phrase “You Touch My Heart” using the free printable available here. Cut these into strips. Using double stick tape or a glue stick, add the phrase to the top of your box. Add the name of the child to the top of the box, below the opening, using a computer print out, marker or letter stickers. Kids can do both of these steps as well. 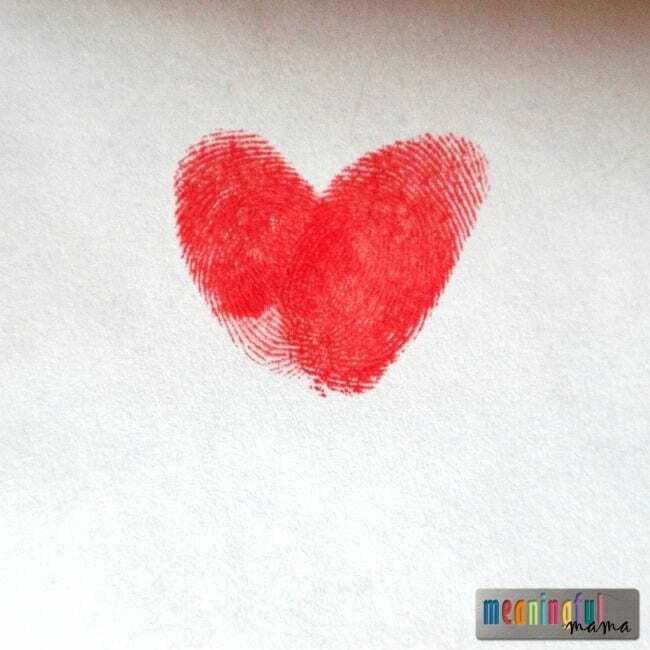 Using a red ink pad, kids will press their finger into the pad and learn to make a heart shape by stacking two finger prints together as shown. Each child will now have their own unique box. There will be no other exact same product in the world. 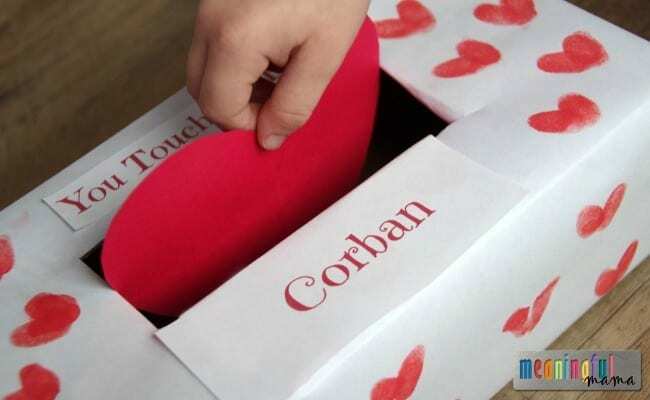 I love the thought of using these as a Valentine mailbox, but it would also be great to have older kids write nice notes to their peers saying how their hearts have been touched by another person’s actions.